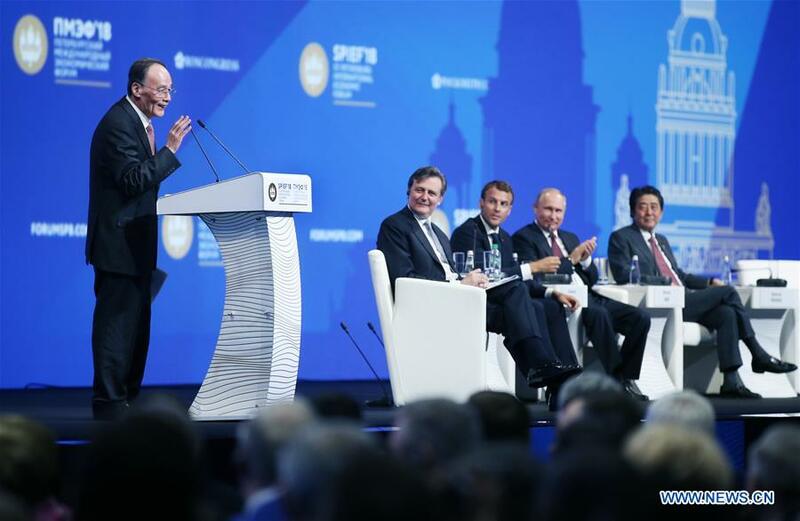 ST. PETERSBURG, Russia, May 26 (Xinhua) -- The 22nd St. Petersburg International Economic Forum (SPIEF) concluded a plenary session Friday as world leaders gathered here to discuss pressing economic challenges. Held under the theme "Building a Trust Economy" this year, the forum, often referred to as Russia's Davos, attracted some 15,000 participants from 70 countries to Russia's "northern capital" and second largest city. "Global mistrust is calling into question the prospects of global growth," Russian President Vladimir Putin told the forum. Also speaking at the forum, French President Emmanuel Macron said trust is being lost in the international arena and "we need to develop a multilateral approach" to solving international issues. Describing Russia as "an inalienable part of Europe," he said, "In view of our history... and our common interests, we must work on strengthening mutual trust." Echoing Macron's remarks on cooperation and interdependence among countries, Japanese Prime Minister Shinzo Abe said Russia's economic growth would benefit its neighbors including Japan while highlighting the importance of cooperation in solving their territorial disputes. He also expressed a willingness to conclude a post-World War II peace treaty with Russia. In response to Macron's and Abe's appeals, Putin said, "A prosperous future cannot be created by working in isolation ... I am sure we will certainly be successful if we strengthen mutual trust and the spirit of partnership." As a result of global mistrust, trade protectionism is making a comeback. Discussions at the forum voiced concerns about the trend's impact on global economic activities and growth. "It would be a grave mistake to resort to protectionism and to unilateralism. This would be a self-inflicted wound," she said. Putin also expressed the concern that the system of multilateral cooperation built over decades is being "crudely" destroyed while violating rules is becoming a rule. "Open markets and fair competition are gradually replaced by all kinds of exemptions, restrictions and sanctions... The spiral of sanctions and restrictions is only widening, harming more and more countries and companies," he said. In addition, Wang reaffirmed China's commitment to its opening-up and welcomed countries to share in the opportunities, including taking part in the Belt and Road Initiative, a new platform for international cooperation. Speaking of the U.S. trade deficit with China, Lagarde said, "One country should not look at one single deficit with another country but its overall position vis-a-vis the rest of the world. That's how trade works. It's a strange complaint (by Washington)." She said major trade disputes between the United States and China should be settled at the World Trade Organization (WTO). Russian experts praised China's efforts to promote free trade. "China is a consistent supporter of an open economy and broad international economic cooperation ... China defends free trade and compliance with WTO rules," said Sergei Uyanayev, deputy director of the Institute of Far Eastern Studies at the Russian Academy of Sciences. "The country considers it unacceptable to build unjustified protectionist barriers." "All that calls in our view for a renewed multilateralism...It is through those institutions and through no other means, particularly unilateral ones, that things will actually improve," she said. "It is very important for us to draft and introduce together a legitimate mechanism of change, which will allow the international community to get rid of obsolete and sometimes inefficient and archaic norms, preserving all the best practices and creating new instruments that meet the requirements of the time," he said. While praising Russia as a constructive player in global economic governance, Wang reiterated China's support for reforms in particular intended to promote the role of emerging markets and developing countries. In this regard, Yaroslav Lissovolik, chief economist of the Eurasian Development Bank, said China has made important initiatives in recent years, citing "BRICS Plus" and the Belt and Road Initiative. "China is channeling huge funds for the development of infrastructure in developing countries. So from this perspective, China has done a lot of work that serves to support multilateral trade, openness and liberalization in the world economy," Lissovolik said.